Let us set forth on a tour amidst the alleyways of the Christian Quarter festively adorned in the Easter tradition. 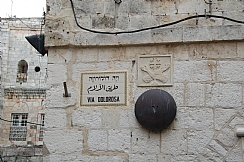 As we tour the alleyways and churches of the Christian Quarter, absorbing the holiday spirit, we will learn why it is customary to eat painted eggs and chocolate bunnies on this holiday, how the faithful greet one another during this time, and what links the Jewish Passover to the Christian Easter. The sites of the tour include <?xml:namespace prefix = st1 ns = "urn:schemas-microsoft-com:office:smarttags" />Christ Church (Church of the Messiah), San Salvador Church, the Church of the Holy Sepulcher, and the Via Dolorosa.